Urban parks, trails, and other green spaces are vital amenities for city dwellers. Research consistently shows they bring a number of health, social, and economic benefits to residents. These public green spaces are particularly beneficial to low-income people, children, and older adults who might not be able to afford private gyms or lack the means to access distant destinations like national parks. But new parks can also bring negative consequences to low-income communities; when parks come in, so do more affluent, and mostly White, residents, often resulting in the displacement of the very low-income people the park was intended to serve. This process has been called environmental or green gentrification. In our recent study titled “’We’re not in the business of housing:’ Environmental gentrification and the nonprofitization of green infrastructure projects,” published in the journal Cities, we examined the planning efforts that led to the construction of The 606, a 2.7-mile elevated urban trail that opened in Chicago in 2015 and has been compared to New York’s famous High Line project. Community-based organizations were the initial proponents of this project, which was intended to add much-needed green spaces in some of Chicago’s most park-poor neighborhoods. But well-intended efforts to do so backfired, as The 606 led to significant increases in home sale prices and the eventual displacement of many long-term, low-income residents from the Logan Square and Humboldt Park neighborhoods. How do well-meaning efforts to green low-income communities result in environmental gentrification? Projects like The 606 are increasingly completed through public-private partnerships wherein a nonprofit organization becomes the project manager who then coordinates numerous public agencies such as parks and recreation, transportation, and planning departments. In our study, we asked whether the reliance on a nonprofit as the project manager for The 606 might have contributed to fast-tracking environmental gentrification in the surrounding neighborhoods. We conducted interviews with city staff and members of nonprofit organizations working on parks and affordable housing. We also reviewed numerous planning documents and accounts from the press. 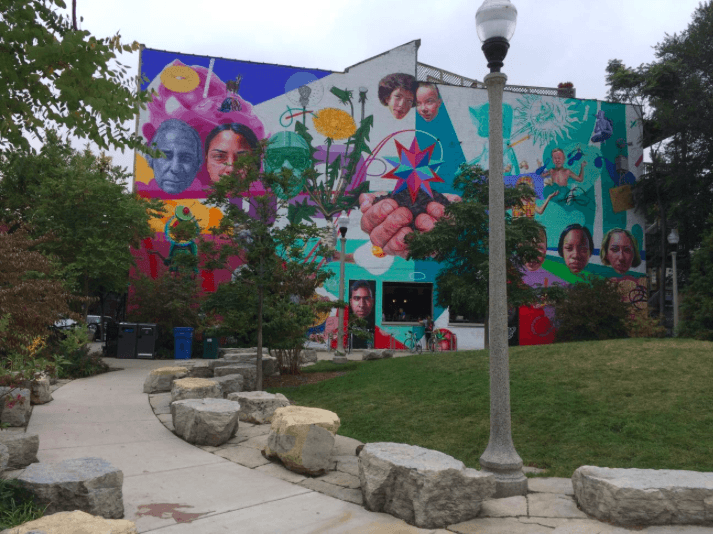 We found that delegating the project management of large green spaces such as The 606 to a parks-centered nonprofit organization has several advantages, namely increased capacity for community outreach and fundraising. But some of these benefits were outweighed by the environmental gentrification that reliance on a public-private partnership tends to foster. 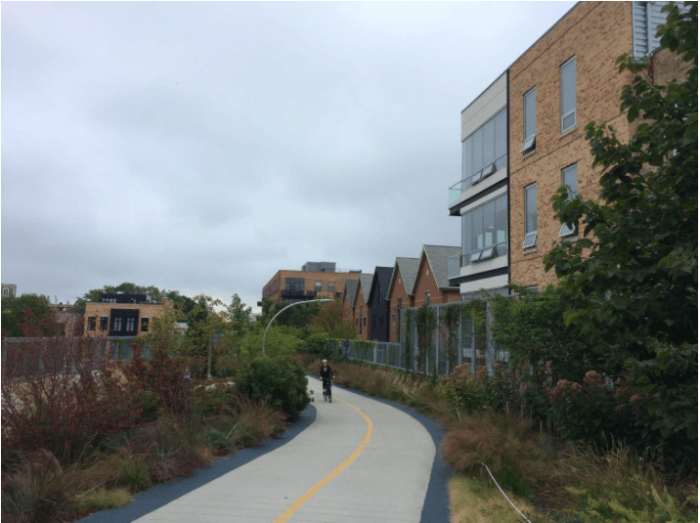 Relying on a parks-oriented nonprofit – rather than one also dedicated to housing – to manage The 606 contributed to the fragmentation between initiatives to build green spaces and efforts to build or preserve affordable housing. The nonprofit that managed the development of The 606 is committed to achieving equity in access to parks, but its staffers admitted that the organization simply does not have the expertise to work on affordable housing. By assigning project management duties to an organization that is “not in the business of housing,” the City of Chicago set up a planning process with very little focus on housing affordability, increasing the chances of gentrification many times over. In addition, interviewees noted that addressing gentrification concerns proactively is particularly difficult in Chicago because no overarching coalitions work on parks and housing jointly. We attribute this to historical ethnoracial differences between nonprofits working on parks – who are mostly white – and those working on environmental justice and affordable housing – mostly people of color. So because fragmented neighborhood organizations did not come up with a comprehensive strategy combining parks and housing, those groups that wanted The 606 completed without implementing serious affordable housing initiatives – including Mayor Rahm Emanuel and the powerful development community – gained the upper hand. Local nonprofits were the initial champions of The 606 project, which they saw as a means to create green, healthy places for long-underserved communities. But as concerns about gentrification and displacement ramped up in the years preceding The 606’s ribbon-cutting, environmental justice and affordable housing advocates felt the City of Chicago and the developers had used sustainability and public health arguments to “greenwash” the project and win over any naysayers decrying the inevitable gentrification the project would bring. Those advocates were in a bind: How could they argue against an amenity that would bring the health and environmental benefits for which they had fought for so many years? Relying on a parks-oriented nonprofit to manage the design and construction of projects like The 606 reduces the accountability of public agencies and nonprofits themselves. Some local advocates argued that the city and the Mayor might have employed this strategy deliberately: for one, using a nonprofit as the face of the project allowed the Mayor’s office itself to avoid difficult conversations on gentrification and housing affordability. In addition, nonprofits cannot be voted out of office like elected officials can. As the parks-oriented nonprofit “took the hits” when gentrification concerns arose, the Mayor and other public officials mostly appeared in photo-ops such as the project groundbreaking. What can we learn from the story of The 606? Are there ways to green historically disenfranchised neighborhoods without pricing out their most vulnerable residents? The results of our study suggest two promising strategies. First, parks-oriented and housing nonprofits should form coalitions through which parks and housing issues are tackled together. The Los Angeles Regional Open Space and Affordable Housing (LA ROSAH) collective is a great example. LA ROSAH recently published a working paper on what they call “joint development,” or the simultaneous construction of parks and affordable housing in integrated sites. A second promising model calls for nonprofits to work across parks, housing, and labor sectors. Building Bridges Across the River, a nonprofit leading the development of the 11th Street Bridge Park in Washington, DC, seeks to address gentrification concerns associated with this 55 million dollar project by proactively developing and implementing an Equitable Development Plan. This plan includes creative strategies to produce and preserve affordable housing as well as provisions to create jobs for the long-term residents of the affected communities. Our findings and these best practices demonstrate that planning efforts by non-profits and public agencies must be cross-sectoral and proactive in anticipating the seemingly inevitable gentrification that results from park investments. These findings are described in the article entitled “We’re not in the business of housing:” Environmental gentrification and the nonprofitization of green infrastructure projects, recently published in the journal Cities. This work was conducted by Alessandro Rigolon from the University of Illinois at Urbana-Champaign and Jeremy Németh from the University of Colorado Denver. 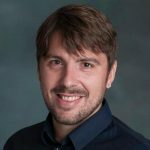 Alessandro Rigolon is interested in environmental justice issues related to urban green space and their impacts on health equity. His current work falls in three areas: policy determinants of inequities in park provision, drivers and resistance to gentrification fostered by new parks (i.e., “green gentrification”), and the public health impacts of urban green space on marginalized communities. I am currently an Associate Professor of Urban and Regional Planning and the Director of the PhD program in Design and Planning at the University of Colorado Denver. My research looks at how planners, designers, and city dwellers can help create more socially and environmentally just places. I am particularly interested in the relationship between social equity and the built environment, and my recent work examines issues of disaster justice, transportation equity, and gentrification resistance.